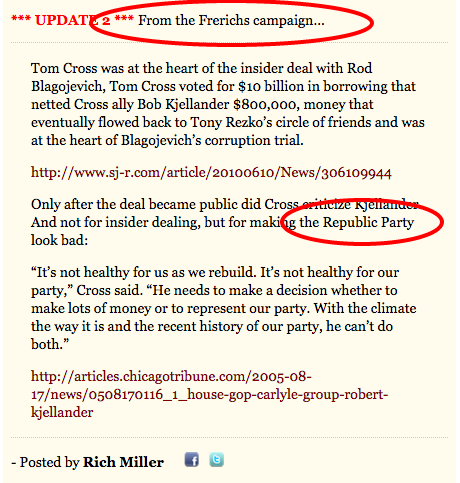 What's The "Republic Party", Mike Frerichs? You couldn't script a campaign narrative better than the one that Treasurer's candidate Mike Frerichs and his brain trust down in Champaign have been pulling off. If you wanted to sum up the campaign in one word it would be: bumbling. They CONTINUE to make mistake after mistake. Sure...lots of them are small things - like using 'compliment' instead of 'complement', but when you add them all up it shows a clear pattern of ineptitude and laziness. Seems as if someone - *ahem* the campaign press guy - has been spending too much time wading into the comment section over there to take the time to actually craft an intelligent, and error-free response? Guess they're still going to need that proofreader after all, eh?